After originally majoring in English Literature as part of a Bachelor of Arts Degree at Sydney University, Ross then trained as an actor at the National Institute of Dramatic Art (NIDA), working as a professional actor for a period of fifteen years. During that time he worked across most mediums in the performing arts industry. He was a member of the inaugural Bell Shakespeare Company in 1991, helping to establish the company's education arm, as well as being a core company performer. Whilst working as a professional actor Ross began teaching performance skills at a variety of institutions, eventually making this his primary point of focus, something he has continued to explore in various forms for a number of decades. His broader interest in communication also saw him train and work as a lawyer and then as producer and presenter of ABC local radio programs, an experience that left him with a strong and abiding love of that institution and its role in the broader fabric of Australian life. In 2004, Ross joined the Performing Arts team at what is now Federation University Australia's Arts Academy. Teaching acting and directing in-house student productions has provided him with powerful insight into pedagogically driven performance. He also holds a doctorate in Theatre Performance, specialising in the area of theatrical adaptation. But perhaps most importantly, his work here at the university has enabled the fullest manifestation of his greater project: helping young artists to achieve their potential as confident, articulate, expressive and authentic communicators. Ross is one of the team members in the acting and music theatre programs at the Academy instructing students in various dimensions of performance. His area of expertise is Acting and the various dimensions of performance involved in transforming basic acting skills into text-based projects. 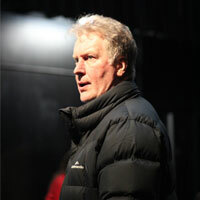 Whilst he does teach into preliminary courses preparing students for the basics of performance, the bulk of his work occurs later - in the second year of study - where the work develops reliable and powerful acting techniques applied to text-based material. In this sense, he specifically prepares actors for the real-world situation of working on plays and other scripted material. He is also one of the in-house theatre directors at the Academy.